Health issues can be responsible for pushing many people out of their homes in retirement, but just because you suffer from ill health it does not mean you need to pack your bags and move into a retirement home. Now more than ever there is help available for those that want to stay in their own homes. George was 73 years old and had suffered from arthritis for most of his life, it had recently escalated and he was told he would need to use a wheelchair. He could still walk but a wheelchair made it a lot more comfortable for him to get about. He lived in a two bedroom semi-detached house. He had thought about buying a bungalow but could not afford to move. “I was told that any renovations I wanted to make to my house which were less then £1,000 could be covered by local authority if they deemed them necessary for me. I contacted my local authority who then sent around an occupational therapist to see me and assess my health and house,” explains George. “Because I spent most of my time in a wheelchair the first step was to install a ramp leading up to my door, instead of the two steps I had their currently. I was also able to get the local authority to install a number of grab rails around the property, which would enable me to get in and out of my chair more easily. They were also able to install lever taps in both my kitchen and bathroom. It could be tricky getting up from a wheelchair and fiddling with tight taps, so the new lever taps made all the difference,” says George. George’s main concern was whether he was still going to be able to get upstairs ok, he could just manage the stairs but knew a time would come when he would not be able to. “I looked into getting a Disabled Facilities Grant, this can cover the cost of any renovations over £1,000. I used social services as my first port of call and they contacted the occupational therapist again who was able to give them a detailed assessment of what I needed in my home, “explains George. “They looked at my savings and whether I was able to afford the renovations myself. If they believe you have the means to pay for the alterations yourself they will not grant you as much money,” says George. George’s house was only small and he needed enough room to manoeuvre about in his wheelchair, so he would need to extend the doorframes on his property. “I was able to widen some of my door frames considerably, this opened up the house and gave me more room to get about. I also changed the angle of some of the door frames so they were not swinging into me, but swinging away,” says George. “The one piece of renovation I considered essential was a stair lift. I knew that having one would make it so much easier for me to get up and down the stairs. My local authority was able to give me some money towards this but my family also helped out,” explains George. A stair lift is installed by adding a second banister rail to a staircase and then the mechanical seat can easily run up and down, carrying you safely up or down stairs. One of the trickiest things George was finding was getting in and out of his bath. 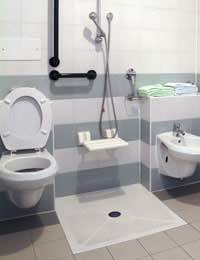 “I had a number of options with the bathroom, I had already lowered the sink and the toilet so I could access them more easily but I was having real trouble with the bath. I was told two possible solutions would be to either install a walk in bath or a bath lift. “My bathroom was not huge and I didn’t think I needed a life at the present moment, so I opted for a walk in bath, which was a lot safer than climbing in,” explains George. Renovating your house can lead to a happier healthier life in retirement, so if you think your home could be improved contact your local authority for more information, as it could mean the difference between you staying in your own house or moving out.